The Americana at Brand in Glendale will be lighting up 10,000 lights and 15,000 ornaments on its 100 foot tree as fireworks fill the sky this Thursday, November 18 at 7:30pm for its Third Annual Tree Lighting celebration. 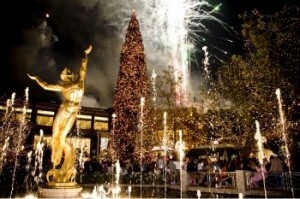 Last year's tree lighting at the Americana at Brand with fireworks and all promises to be even bigger this year! Dancing with the Stars’ Mark Ballas will kick off this first of the season holiday event with an original dance number. He’ll be followed by two-time Grammy Award-winner and legendary R&B and soul singer Peabo Bryson who will perform Christmas favorites and popular songs. Dancing with the Stars' Mark Ballas will kick off the event with a dance number. There will also be a special musical performance from the cast of North Hollywood’s El Portal Theatre’s cast of Cinderella: A Christmas Story which includes Jerry Mathers, “Beaver” from the sitcom Leave it to Beaver as Cinderella’s father, Harry Potter’s Freddie Stroma as Prince Charming, Broadway star Jennifer Leigh Warren as the Fairy Godmother and newcomer Veronica Dunne who as Cinderella. Ballas also contributed special choreography to the production. And the grand man of Christmas himself — Santa Claus — will be welcomed with great pomp and circumstance by the La Canada High School Marching Band, while the Faithful Central Bible Church Choir sings holiday classics.